Here are just A FEW of our articles, if you would prefer to view MANY MORE articles from one of the sections below, please click in the relevant box. 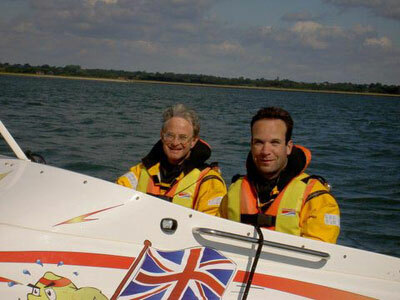 We were in Cowes in 2010 when Dave first noticed that there was no World Record for the Poole to Cherbourg run. This rattled around in our heads for a year or so until Mike’s wife Maggie said ‘ for goodness sake guys, stop dreaming, either do it or forget it’. That rather focussed our minds so the planning started…..
And, in September 2011, Mike, Dave and Dave’s wife Wendy ran Hot Lemon from Poole to Cherbourg in 67 minutes 12 secondsto set the first World Record for this course. A few years ago, Dave noticed that the time for the Southern Islands Record stood unofficially at approx 20 hours. This equated to a speed of about 26 knots for the course which has a distance of 535 nautical miles ( 616 statute miles). The course comprises a loop which must include the Isle of Wight, Alderney, Guernsey, Jersey and the Isles of Scilly. As Hot Lemon can run at 60 knots we thought we’d give this a go so we added one of our deck fuel tanks so as to give a total fuel load of 1450 litres ( 320 gallons) and then waited for the correct weather… and waited…and waited and… on the 5th November 2006 we got lucky with a cold, frosty, misty but calm day and we set to sea at 06.30. We had a few problems along the way including a near calamity at the Isles of Scilly but fortune smiled on us and we finished as darkness fell in a time of 9 hours 57 minutes 36 seconds, less than half the previous time … job done. Hot Lemon 5 with Mike & Dave reclaim a Round Britain Record. 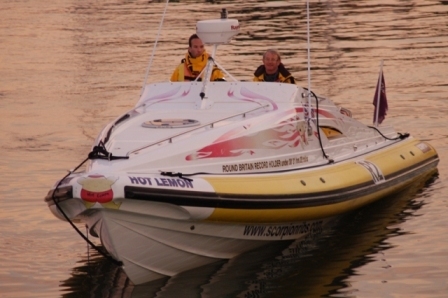 In 2001 Hot Lemon 3 had set a new Outright Fastest Round Britain Record at 42hrs 54mins 25secs and then, in 2002, Hot Lemon 4 with Mike, Dave & two friends set an even shorter time in 37hrs 49mins 50secs. 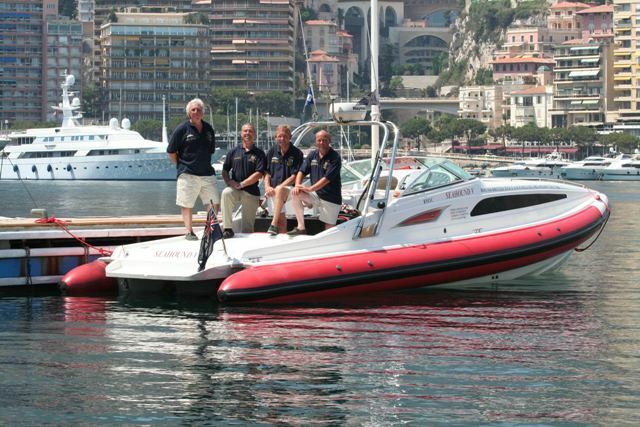 But...this wasn't quick enough for Hot Lemon and on 11th-12th August 2005, Mike & Dave set a new time for the under 30' Round Britain Record of 31 hours 22 minutes 46 seconds in Hot Lemon 5, a 10m Scorpion Sports Cruiser with twin standard spec Yanmar 320hp diesel engines. Hot Lemon 5 has a twin-stepped hull, a deflector instead of a windscreen and an aerofoil section support for the radar, nav lights, twin vhf aerials and masses of navigation gear. At 3900 RPM the Yanmar engines each used 60 LPH (54kts) but only 45LPH at 3500RPM (48kts); to carry the extra fuel weight, we used 5 blade 28'' pitch props. (Our usual 32'' 5 blade props give us 60 kts when light. hot lemon has twin 100 gall underdeck tanks and we added a 190 gallon deck tank for the Round Britain run. To try to break the record was going to be a real challenge as we knew that going around the British Isles is a lot tougher than Round Britain, one for the men rather than the boys (sorry Mike!). The West Coast of Ireland and the run outside the Outer Hebrides to the Shetlands is very exposed to the Atlantic swell. The Shetlands are further north than Oslo and Reeds Almanac states ‘weather conditions are bad in winter; yachts should only visit Apr-Sept’. 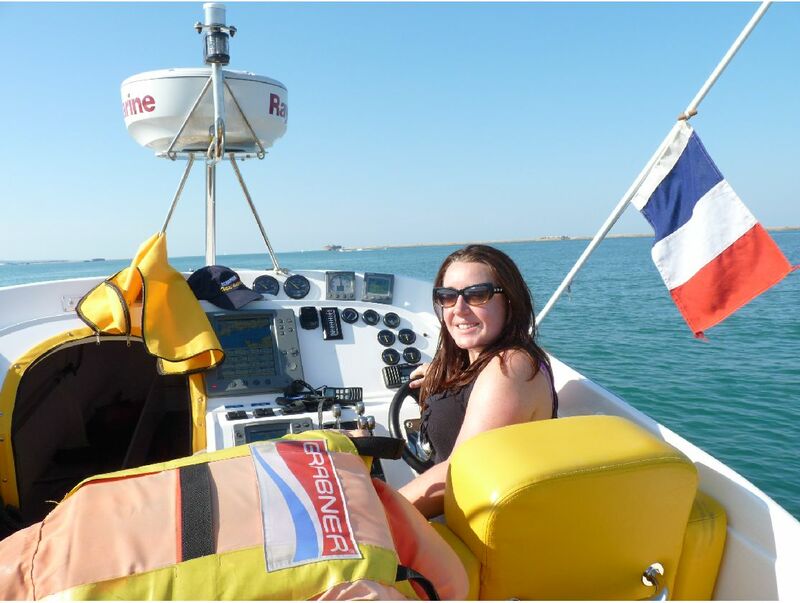 And here is another adventure story from Chris in his RIB Seahound. 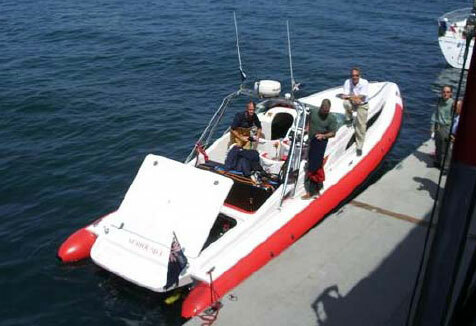 In September 2005, I was enjoying a celebratory drink with friend Mike Deacon after the team and I had set the record earlier that year for the fastest time Round British Isles in 72 hours and 27 minutes in my RIB Seahound V, a Scorpion 10 metre cabin RIB fitted with 2 x 315hp Yanmar Diesels, our time was 36 hours faster than the previous record. I suggested looking at the RYA homologation book to see what other records could be challenged, as Mike and his son Dave also have a taste for breaking records themselves. I was part of Mike's team when we set the Round Britain records in August 2001 in Hot Lemon 3 and again in 2002 in Hot Lemon 4. I was now intrigued to see that the London to Monte Carlo record had no record set in the 30-50ft classes.